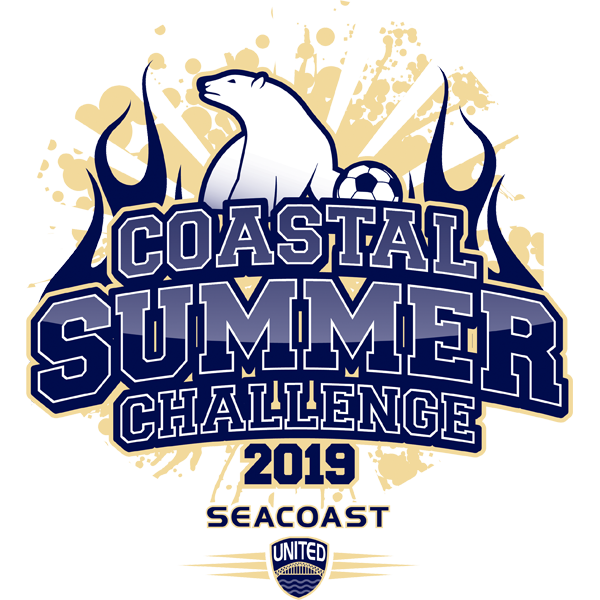 The Coastal Summer Challenge offer's 2 options for registration: An electronic tournament check-in option is available in addition to the regular in-person check-in 1 hour prior to your first game. Click here for more information. Permission to Travel forms are not required for any team from a Region 1 state. Each team in the U13-U17/18 (High School) age groups is allowed a maximum of 18 players. U11 and U12 teams playing 9v9 may roster no more than 16 players. Teams in the U9 and U10 age groups playing 7v7 may have no more than 14 players. Three guest players will be allowed, provided they have valid player passes for the correct age group and are listed on the roster at check-in, prior to the start of the event. Players participating on a team must be listed on the roster prior to the start of the event. Players may not be added over the course of the weekend. Rosters become final when they are submitted for check-in. Players may not compete on two teams within the same division. Doing so will result in a forfeit for 2nd team fielding the double rostered player. Defensive player must retreat to midfield on goal kicks. Offside rule is in effect for all U9 & U10 games. No penalty kicks or direct kicks. No heading, please refer to "Heading" section. No heading at the U9/U10/U11 age groups; will result in an indirect free kick from the spot of the infraction. Heading is only allowed at U12 and older age groups. Offside rule will be in effect for all age groups (U9-U19). Team listed first is designated the home team. If teams have similar colored uniforms, at the determination of the referee, the home team shall change jerseys. All players must have matching colors for uniform shirts, shorts and socks. The only exception is the goalkeeper, who must wear a different color jersey. All players must wear shin guards. Players without shin guards will not be allowed to enter the playing field. Prior to a throw-in, in your favor. No substitutions on corner kicks. Any team not ready to play within 10 minutes of the scheduled start time will forfeit the game to its opponent by a score of 3-0. A team in the U17/18 (High School) age groups (11v11) that cannot field 7 players at start time, shall forfeit the match to its opponent by the score of 3-0. Example: If three teams played three games and two teams played two games before cancellation, the winner will be the team with the most points earned in the first two games played. A game is official if it reaches half before it is cancelled. Otherwise the game is delayed. If the fields need to be cleared an air horn will be sounded at Bowdoin. At an offsite field the head official will make the decision to clear the field. In an extreme emergency people may enter Farley field house. Preliminary matches ending in a tie will remain a tie: there will be no overtime periods in preliminary games. Semi-final and final matches ending in a tie after regulation will proceed directly to penalty kicks according to FIFA tie-breaker rules. Points will also be awarded for each goal scored (max of 3 per game, losing team may receive points also), and 1 point for a shutout. Playoff seedings will be determined differently in each bracket depending on the number of teams entered. Playoff rounds will take place on Sunday morning/afternoon depending on schedules. Divisions of 8 (2 brackets of 4): Each team receives 3 round robin/group play games. Top team from each bracket will meet in final. Divisions of 6 (2 brackets of 3): Each team receives 2 round robin/group play games. Top two teams from each bracket play cross-bracket semifinals (A1vB2 and B1vA2) while the 3rd seeded teams will meet in a consolation match. Winners of the semifinals meet in the final. Divisions of 5 (1 bracket of 5): Teams will each receive 2 games. 3rd game for each team is determined by seeding based on the results of the 2 preliminary games. #4 seed plays #5 seed in the consolation match. The #1 overall seed will advance directly to the final. #2 v #3 seeds meet in the semifinal with the winner advancing to face the #1 seed. Divisions of 4 (1 bracket of 4): Teams receive 3 round robin/group play games. Top two seeds will play each other in the final. Playoff Rounds: Semi-final and final matches ending in a tie after regulation will proceed directly to penalty kicks according to FIFA tie-breaker rules. 1. Winner of head-to-head competition. Example of point system: a 0-0 tie will be scored as 4 points for each team (3 points for a tie, 1 point for the shutout); a 4-2 game will be scored as 9 points for the winning team (6 points for the win, plus 3 points for goals) and 2 points for the losing team (2 for the goals scored). **A game abandoned by a team will result in the opposing team winning. The final score will be based on the score at the time of forfeit. **No poins are awarded if neither team shows up. Coaches: A red card or two yellow cards earns the coach a game ejection from the present game and the next game. With any red/yellow card, the coach shall be disqualified from coaching for the remainder of the tournament. No smoking: No smoking will be allowed on any game field, this will include coaches, players and spectators. Adults wishing to smoke are requested to remove themselves from the playing areas. Alcoholic beverages: Consumption of alcoholic beverages is prohibited at the tournament. Sportsmanship: All players, coaches, and spectators are expected to display the best of sportsmanship behavior at any and all times. Anyone not able to comply with this rule will be asked at the discretion of the tournament committee to remove themselves from the field. The Coastal Summer Challenge adheres to Soccermaine’s Zero-Tolerance Policy for coach, player, and spectator behavior.